Google’s book archive sheds light on our differing views of the sexes. Usually, big, airy questions about society are difficult to answer with hard data. For example, if you’re wondering how our culture views men and women differently, the answers are more likely to come from cultural critics and novelists than empirical science. But Google is changing that. 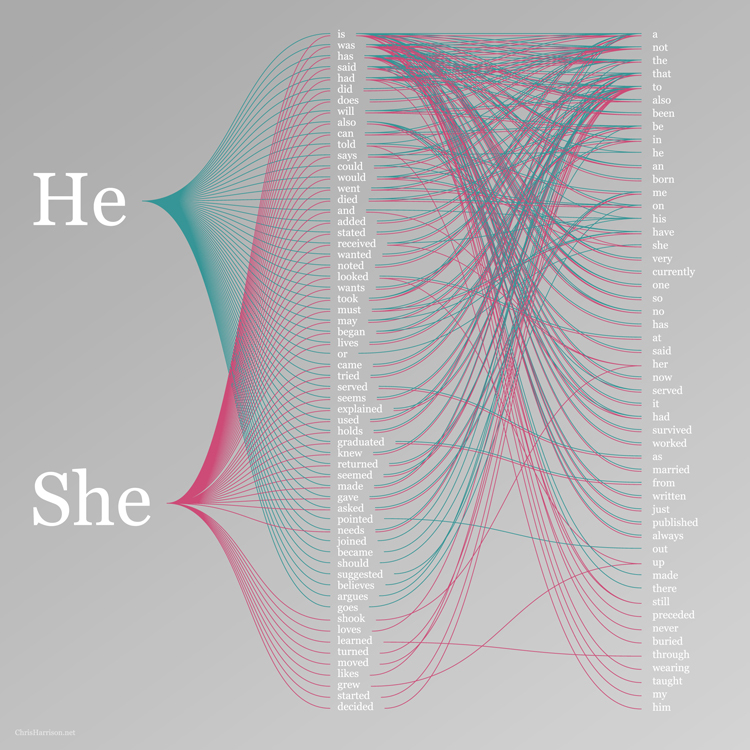 Chris Harrison, a graduate student in engineering at Carnegie Mellon, created a remarkable graph of how “he” and “she” are used in Google’s massive digital books archive, which contains some 200 years worth of published material. The results provide a totally unique look at the varying perceptions of men and women. So, for example, you see that “he argues” is quite common–which is either a statement about men being argumentative, or being enmeshed in battles of logic and reasoning. By contrast, women often find themselves mentioned in sentences such as “she loves.” Where one phrase might denote an assertive intellectualism, the other denotes a more passive emotional state (“she loves,” after all, doesn’t actually say whether that love is recognized, returned, or worthy). Men are from Mars, women are from … well, you know. You can tease apart other subtle variations along those lines. For example, “he believes” appears on the list; the closest analogue for women is “she likes.” Again, “he believes” seems like a more forceful statement of intellect; the second, “she likes,” is a far more passive declaration of simple preference. And likewise with “she decided,” which hardly has the willful heft of “he argues.” It’s hard to avoid that age-old conclusion that men are seen as active agents of influence in their world, while women are viewed as more passive and emotional. What’s surprising is that an analysis of millions of books over 200 years bears this out. Backing up, you can surmise that “he argues” is probably so common among men because they have dominated published academic discourse–and the phrase is stock in academic debate. But even that meta-explanation alone tells you a lot about men vs. women, while roping in data from previously unforeseen terrain.